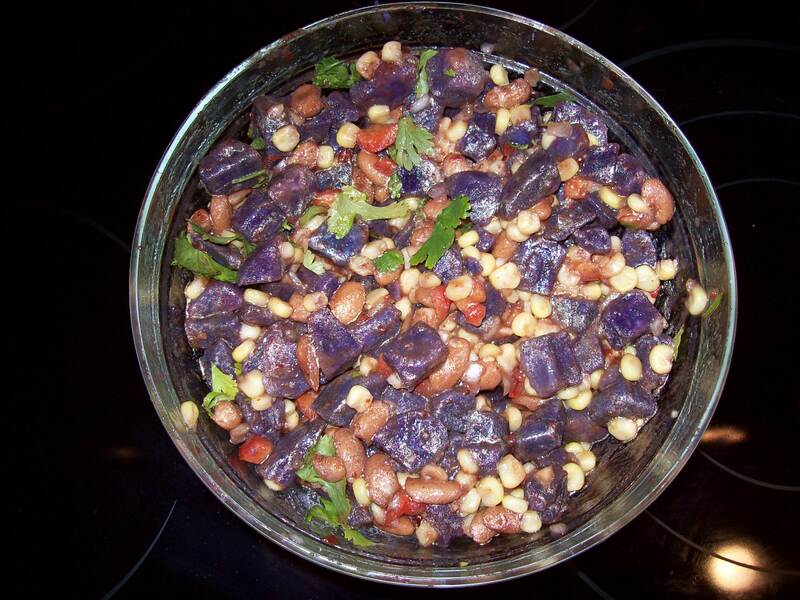 Spicy Blue Potatoes & Corn Salad. I wondered why I open the lower frig draw and saw blue or purple potatoes, I’m color blind can’t tell the difference, was Lyn hinting she wanted something different, was she challenging my adventurousness? Then she came to me and said those words I have heard so many times before, “Do you think you could make this?”(from Isa Chandra Moskowitz). Sure no problem but what will we have with it, soon there was a trip to the meat market and a steak, pork chop and a couple of pounds of ground sirloin later we were headed back to our kitchen. Who would have thought a few potatoes could lead to a trip to the Meat House. New butcher shop we found via LivingSocials so we decided to try it we will compare to Wholefoods quality. Forget about what we have in the freezer this called for fresh meat. 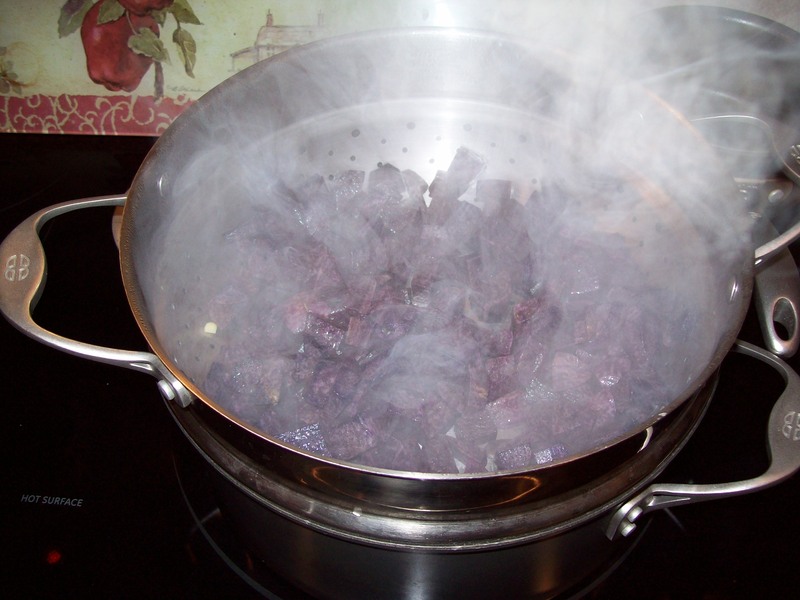 Prepare your steamer while you prep the veggies. First steam the corn about 5 minutes if on cob, about 2 minutes if frozen kernels. Remove the corn from the steamer put aside to cool. Place the potatoes in the steamer and steam for about 7-8 minutes until tender enough to pierce with a fork, but not falling apart. Remove and set aside to cool. In the meantime, preparing the dressing. Note: I usually just put the ingredients together in a bowl eyeing the measurements but decided to take a picture hence the little bowls that Lyn got me a while back for prepping. 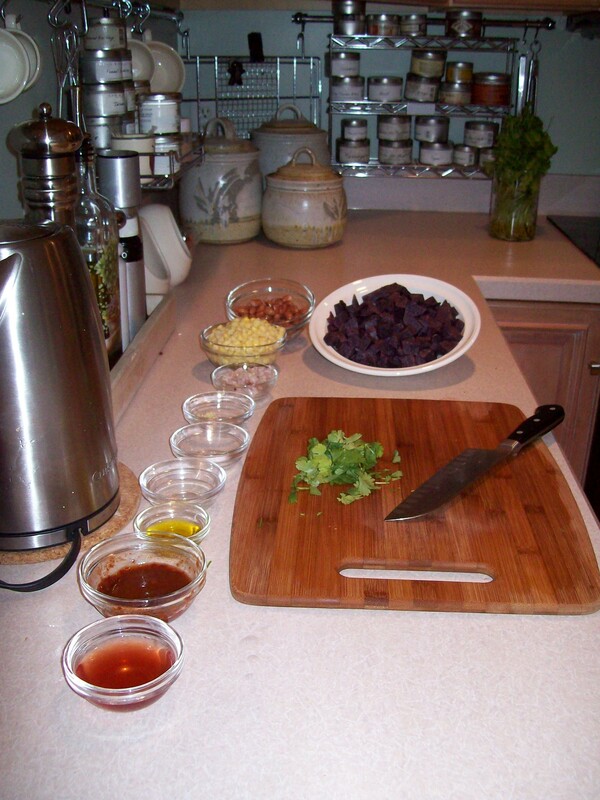 In a small mixing bowl stir together the vinegar, chipotles, adobo, oil, agave, water, and salt. Grate in the garlic or add the minced garlic. When the corn is cool enough to handle, place in a larger mixing bowl pointy side up. Steve Hint: I like to place a small cup or bowl bottom side up inside the bowl and place the flat side on the cob on the bowl bottom making a stand. This makes it easier to run you knife along the corn cob removing the kernels from the cob. Break apart separating kernels. If using frozen corn then all that is done already isn’t it. Fold in the cooled potatoes, pinto beans, red pepper and red onion (shallot). Steve tweak: Instead of steaming the corn on the cob I would grill on the BBQ that would add a smoky flavor and sweeten up the corn little. 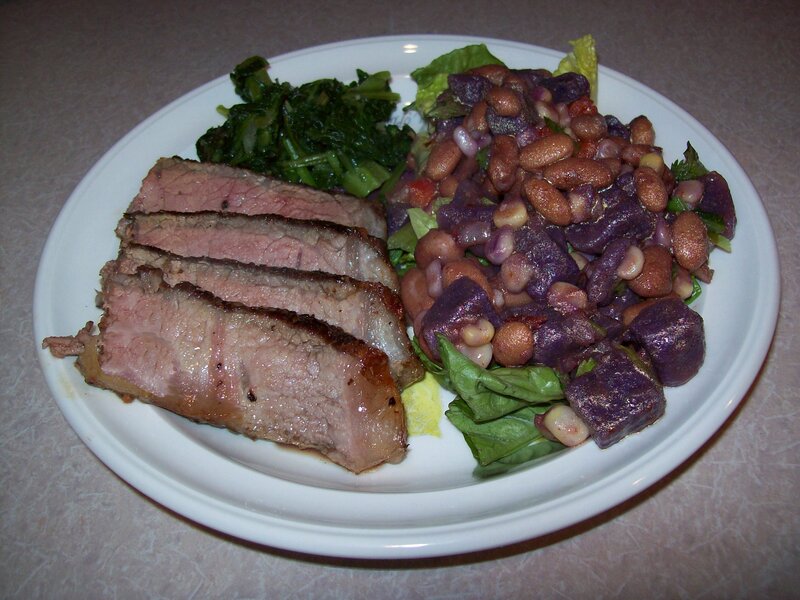 This entry was posted in Potato, Side Dish, Vegetables and or Vegetarian and tagged Garlic, Isa Chandra Moskowitz, Paprika, Potato, Red onion, Salad, Tablespoon, Vinegar. Bookmark the permalink.